Ever since I went to see Wicked a few years ago, I was bit by the theatre bug and have since added Les Miserables, Chitty Chitty Bang Bang and The Lion King to my list. Going to the theatre is one of those experiences that I forget how magical it is until I’m sat there in a seat and the lights go down, instantly lighting a fire in my belly and wishing I could see a show every day. 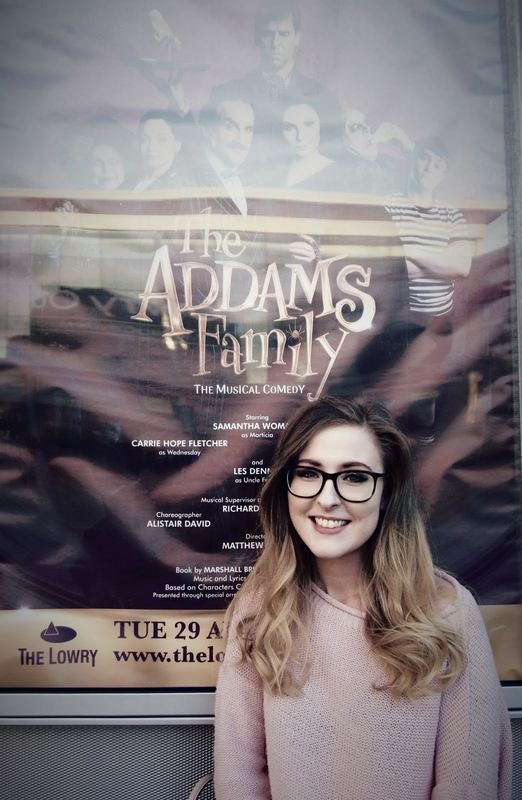 Since being bit by this theatre bug, I’m always checking to see what shows are on in Manchester, and when I saw that The Addams Family was coming to The Lowry, I had to get tickets! So, last Thursday myself and my gorgeous friend Lesley made our way to the lowry, in golden hour might I add so the walk there was absolutely beautiful, and took our seats in the dress circle for two hours of incredible singing and hilarious comedy! I don’t really know what I was expecting from this show, because it’s been years since I watched the film, but it blew me away! First of all I have to talk about the singing. Obviously Carrie Fletcher was incredible, as she is in everything. Her voice was crystal clear on every note and my gosh that girl can belt! I also loved the voice of Charlotte Page, who plays Alice Beineke, which she so easily switched up to match what the character was going through. One minute it was soft and operatic, the next it was rough and powerful. The entire cast was incredible and I’m pretty sure I got goosebumps in every song! The main thing that I loved about this show though was the comedy! It's advertised as a musical comedy so I knew I was in for some laughs but it surpassed any expectations I could've had for it. Every single character had their own funny moments but my favourites were probably Lurch, played by Dickon Gough, who for someone who said so little was so funny, and also Gomez Addams, played by Cameron Blakely. He was IN-CREDIBLE. He honestly had me belly laughing through so many of his scenes and I loved his character! It was the perfect mix of sincerity and humour and was honestly just fantastic. I could tell you how much I loved every character in this show but that would make this post ridiculously long so I’ll leave it at that! But honestly, every single actor is incredible and I urge you to go and see it whilst it’s on tour. You won’t regret it! Do you like The Addams Family? I had no idea there was a musical for the Addams Family, but I would love to see that! Especially this time of year as we gear up for all things Autumn and Halloween. I love the theatre! The very first show I saw was Beauty and the Beast when I was about 8. I saw Lion King a couple of years ago and Mary Poppins when I last went to New York. I've ALWAYS wanted to see Wicked, Mama Mia and Joseph and the Amazing Techni-Colour Dreamcoat. Looks like you had a great time! I didn't know there was an Addams Family musical, I grew up adoring it, I am going to have to try and get tickets!